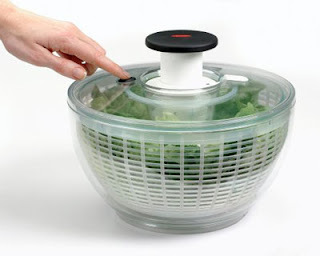 I love my OXO salad spinner. It is very easy to use: rinse, push and brake. Yes, you heard right. Brake. OXO has included a brake button to stop the spinning. I like how it dries my lettuce and helps keep it fresher longer. OXO is always improving their products. The latest update on this salad spinner? Did you know that you can use this for MORE than cleaning lettuce? 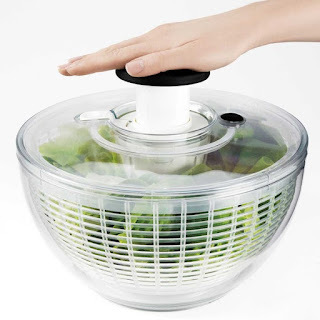 Want to win your own OXO salad spinner? Please follow both steps to be included in the giveaway! Step 2: Click on the Rafflecopter link below to enter. All you need is a Facebook name or email address to enter. All info will be kept confidential and used for the purpose of this giveaway only. This giveaway is proudly sponsored by OXO, creator of many cool kitchen tools. I was given a sample of said product to review with no monetary compensation. All opinions are 100% mine and not influenced in any way. Giveaway is open to all US readers and will end at midnight, June 28, 2012 EST. CONGRATULATIONS TO CARLYN, who loves Italian Dressing! I love a good honey mustard. Yum! I would say ranch is my favorite! Stacey, have you tried making a buttermilk ranch dressing? PW's recipe rocks! I like a sprinkling of LEMON on my salad. Maureen, lemon is very refreshing on a salad ~ my father in law loves a simple balsamic vinegar/olive oil as his salad dressing. 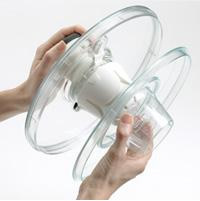 What a cool gadget!I love how you don't have to spin it ~ just pump it. My favorite salad dressing is Good Seasons Italian made with balsamic vinaigrette ~ (blended til it's homogenized). I like any non-sweet dressing -- no honey mustard for me, please -- but I always go back to my lemon/cider vinegar Dijon vinaigrette. Lemon poppyseed!! SO good but not so good for you. Lemon Poppyseed! So good but not so good for you sadly! 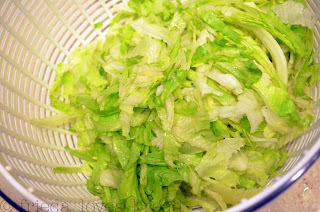 i love my salad spinner too!! my fav dressing is just plain EVOO with balsamic vinegar and salt! Annie's Natural Roasted Red Pepper! Now, that sounds like a yummy salad dressing! I love me some honey mustard! Those were my favorites growing up. My mom would put a touch of French dressing into her potato salad....yum! I would love to win this. OXO is generous. I can always use a new salad spinner. I love Brown Derby's Original Cobb Salad dressing but I substitute Balsamic for the red wine vinegar. Bonnie, I have never tried that dressing; I'll have to check it out! Please use the Rafflecopter above to complete your entry...it's the only way I can randomly select a winner. Good luck! Blackberry Poppyseed dressing. We made it in a cooking class I took years ago. I wish I could find the recipe. Oh, my... you have piqued my interest! If you do find the recipe, please share! Ooh, nice! I always go for the blue cheese or the Italian dressing, but we did get some kind of eggnog dressing with a tiny bit of mustard at our company Christmas party last year at Cucina Toscana. I have never forgotten it and have thought about trying to recreate it some time. This is freaky! I've been looking for a salad spinner this week. There isn't one in my rinky dink town, but was going to check out of town the next time we go for a ride.... I so NEED one of these! I don't see the link to enter...??? Find the +1 Do It located inside the Rafflecopter box and hover your cursor over it. It will highlight green. Click on it and you are entered! Bleucheese or lemon thyme vinaigrette that I make homemade... So good! Either just balsamic vinegar or my mom's easy addition of a little salad oil, some vinegar, salt and pepper, straight on the salad, mix it up and enjoy! Either balsamic vinegar by itself, or my mom's original: A dash of salad oil, a dash of vinegar, salt & pepper, all straight on the salad, mix and enjoy! Anything at all with balsamic is my favorite! I make my own with cider vinegar, dijon, and herbs. My son won't eat any other, so I take that as a compliment. i love marzetti's country french. hard to find these days in my area. my favorite is a mustard dressing my mom makes! My favorite is now a Pomegranate Vinaigrette...love it! My favorite salad dressing is Russian.......yum! My favorite is a good Green Goddess! My favorite dressing is homemade Italian, made with the Wishbone seasoning packets. It's so good! I love Ranch dressing! I just found your blog and am super excited to try some of your yummy sounding recipes! No, you're not boring...it's a classic! it really depends on what type of salad, or what else I am eating....sometimes I like Italian style, and sometimes I like a sweet French....or ranch, or well, you get the gist. Thousand Island is my favorite ... yummy! I love Vidalia Onion dressing. I buy it at Sam's Club and it is so delicious. I really like Olive Garden's salad dressing, and I make a copy cat version of it! I like bacon and tomato. It tastes way better than it sounds. No, that sounds really good! BLT salad, anyone?? Ken's Steakhouse Bleu Cheese or Honey Mustard...please don't make me choose! I love my homemade creamy Caesar dressing, and I love a good ol' homemade Vinaigrette too-so many ways to spin it. vinagrette with a little pepper and Italian seasoning.